A glorious, picture-perfect autumn day in New York. Not a cloud in the sky…with the temperature harkening back to those gorgeous September days when it stood at a perfect 70 degrees. No humidity…excellent hair…and no bugs. Who could ask for more? Even a diehard indoor gal like me found herself inexplicably drawn outside to frolic in the abundant dead leaves and sunshine. It’s like Mother Nature did an abrupt about-face….and instead of steadfastly barreling blindly towards winter, she stopped…perhaps to smell the proverbial roses? We may never know…and I don't think anyone really cares why...we're just so happy with the end result. Carolyn needed a finished product of 15 minutes of video…and as my IV (Clinton Kelly) has often stated, “You only get 1 minute of finished product for each hour of tape”. C: “Sarcasm? Now is not the time for mockery…it’s more like the time for an apology. I told you...you didn't listen. Own it." LLAMA!!! No, j/k I've not clue, I just guessed. or is it an ALPACA. I had to an assingment like that when I was a junior, but I was lucky in the sense that my friend's dad worked with a newstation. So we got professionals to do our. *sigh* living in a place where you know everyone is bliss! Now I feel bad for assuming you were as useless as me at those sorts of things. I mean I do cook obviously, I'm a mother, but baking is well outside my comfort zone. Actually I even hate cooking - if I could afford to order in or eat out every single night I would. I was going to gues Llama but book*addict above doesn't seem to think so. I guess being that your in NYC it must be some breed of dog? Sounds like you had a great weekend, and you cooked as well? Wow, I'm so impressed! Good job and have a great week. Ah now I am very confident in my animal knowledge! book*addict's right. It's either a llama or alpaca by that face. The llama is a good bit bigger than an alpaca and alpaca is especially prized for the incredible softness of it's wool (oohh what I wouldn't give to have a few alpaca so I could try my hand at spinning my own yarn from them but have you seen prices on alpaca???? It's insane!!). That fella's hair looks really soft and fluffy but admittedly it could still be a llama with owners just take much better than average care of their animal's hair. But it also looks like the person standing behind it is a good bit taller, the animal only coming up to about shoulder height or so on them. It could be an incredibly tall person or a picture taken from an angle which only makes it appear as if the animal is that much shorter but I will place my vote firmly in the "alpaca" column based on this picture. now that's a lot of apples in one day. I'm surprised you're not in apple-shock or something. We had apples coming out of our ears this weekend too... Hubby needed some for making mincemeat, but I bought too many, so we had apple crumble and apple sauce with roast pork too. I love apple sauce and apple crumble - strangely I can take or leave raw apples! Is it a very very furry doggie?? After being fed a million apples?? Possibly?? Maybe?? Uh... did you just compare your son to a llama? For your sake I hope the spitting is a lie. (I don't think it is though.) My mom used to compare me to Yoda... apparently my ears stuck out and I didn't have much hair. But at least I get to wield a light saber and be all cool and mystical. It's a bit of a consolation. As for the animal - I'm guessing alpaca. It doesn't look big enough to be a llama. Whatever the little critter is, it's cute! Don't you just love apple season? What to do with all freakin apples? 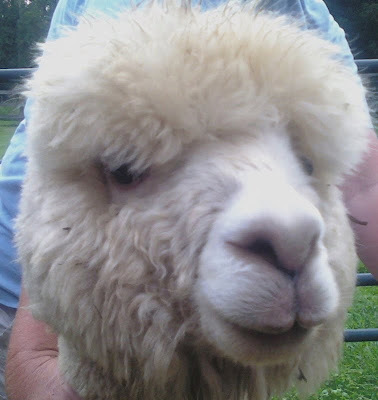 And that's an alpaca.A much sweeter natured animal than a llama, and ha softer fleece too. Please tell me you didn't put the llama in the dish you cooked for Taylor.. I know llama pie might sound cool but they spit a lot and that would be like Taylor kissing one of them...Yes, yes Bella the llama did look cute and all that, well before you hacked her to bits that is. I’m guessing it's still illegal for teenagers and llamas to snog, even In New York…. What else is for dinner? It looks good. I hate apples, myself, so I'm no use to you here. Awww, how nice of Taylor to help her! And I think it's a small llama? Seems like CK needs to be put in his place. Tell him that when HE'S helping teenagers with a project, THEN he can criticize! Put up those mild weed photos for you on Saturday. :o) OK--not JUST for you, but they're there. Hope you had a lovely weekend! "I put up the weed photos for you on Saturday." No bugs??? Wtf? How is that fair? We had warm weather but with warm weather this late in the year we have chinese beetle demon spawn from hell invasions. I had like 500 of those things in my house this weekend. They bite and smell and now my floor is littered with their tiny orange and black carcasses. Eeeewwww. Taylor rocks, the apple things looked awesome, and I'm guessing llama? I agree...yesterday was FLAWLESS! Of course, I worked, but still enjoyed the day. Perfect temps and not a cloud in the sky. And listen...I SO wish I was at your house yesterday because I freakin' LOVE anything APPLE. I just bought a combination pumpkin/apple butter spread that I enjoy on toasted English muffins - YUUUUUMY! Yes, I'm guessing it's a llama??? What an adorable face!!!! Have a great Monday, my friend. It looks like it's going to be another BEAUT! I have the day off, so I'll be spending sometime outside enjoying it. P.S. 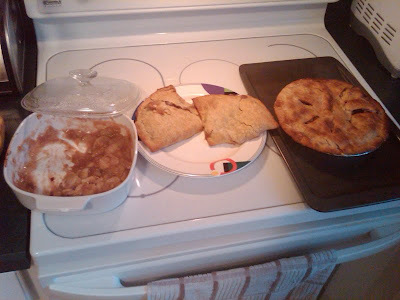 If you have any leftover apple desserts, could you please email me some? HA! I want some apple spice cake! YUM!! As for your little friend, it could be my neighbor, Shirley. Is it a baby elephant seal in a wig? I suppose it may be a llama lying down, a legless llama or a llama with a very tall person behind it. Maybe it's a short, fuzzy, hornless, spotless, blond giraffe with bangs. Rockin' post as usual! ... and are those apple dumplings I smell? Gavin: You've changed your screen name! 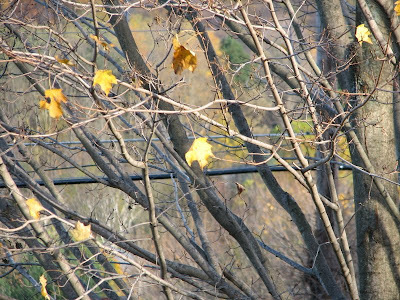 I'm with you, buddy...I'd love a mild winter. I do believe the Farmer's Almanac calls for a heavy, snowy winter, but someone here told me that the wooly caterpillar says otherwise. I think I choose to believe the wooly-guy. book*addict: YES! They're alpacas!! WOOHOO! You win the...the...coupon for a free car wash at my local oil change place! Lou: Oh, you've completely gotten the wrong idea about me, Lou! Yes, I can follow a recipe...with about a 15% success rate, depending on how many times I've already attempted it. The pie? Yeah, me and Betty Crocker. It only took me about 6 years to get it right. Cooking? No. Can. Do. Seriously! Alicia: I'm north of Manhattan now...and there's these crazy people next door that raise Alpacas. It's bizarre-o. But they always look like they're smiling, so how can you not like 'em?? clandestiny: HA! CORRECT, my friend! (Wow...you sure to know an awful lot about alpacas, sweetie!I'll bet they're better behaved than that Hamster from Hell!!) Where does one go to buy an alpaca-something? I'd no idea they were expensive, but assumed they MUST be, since I've never seen an alpaca-anything. 'Cept for the real deal, of course. Runnergirl: Oh, that's funny! Oooh...I didn't think to do apple crumble! I like to eat raw apples with cheddar cheese. I wonder if that's weird? smileyfreak: HA! After being fed a million apples....HA! Yeah, he got all poofed-up from all those apples! UGH. I can't LOOK at another apple! Lauren: Um. Yes (hangs head in shame)...yes, I did. I compared him to an Alpaca. But, in my defense, I think they're cuddly and look like they're smiling...and they really don't smell TOO bad. Well, your mom didn't like, NAME you Yoda (middle name?)...right? I'll bet you were cute! ValleyWriter: YES! I made the applesauce! It is completely GONE...and was wonderful!! Now the paper I printed out is all full of applesauce stains (the sign of a good recipe, right?). And YES...it's an alpaca! You are SO SMART. brite: Oh, you guys are TOO MUCH! I didn't think ANYONE would get the alpaca! Yes, I do love apples, but I do believe we're DONE. Leave it to me to subject da boys to Apple Hell. I'd better start freezing some of it! BlackLOG: Why was I not aware of this spitting-thing? Is it possible that llama's spit and Alpacas don't? Or were they just polite enough to not spit around ME? JD at I Do Things: Well, now I hate apples too. I totally overdid it...would could have imagined that?? Appletini, anyone?? lifelove'n'wine: Yeah, Taylor's a good boy. And yes, I think alpacas are small llamas...which evidently can SPIT. Did you see how close I got to it?? Oh, yay! I'm on my way to your place. I'm excited to see the "mild weeds"...HA! Spot: Ew! You're still having those demon beetle-bug-thingies? Nope...the only things I saw here were some ladybugs and a few errant flies....and the flies died by nightfall. Weird. I'd tell Taylor he rocks, but we won't be able to fit his head thru the door, so we'll keep this info between us...yes? AshleyS: Trust me, if they publish it, I shall mention it. I was blown away by the sophistication of these 17-year-olds...they have a wonderful sense of humor. I'm coming over to visit now! Must say...hilarious post. But then again, you always make me laugh. Thanks for brightening up my days! Hello! I have been reading your blog, you are funny. I haven't had a chance to comment! Be careful what you wish for with the winters though. I lived in New York and moved to Arizona where it is still in the 90's! I would give anything for a bit of cold and snow now! snoble24: Very close! It's an alpaca...which I believe is in the llama family. Yes...totally too many apples!! Oddyoddyo13: You are very welcome! You brighten up MY day with your comments, so it's a win/win! Christiejolu: Welcome! I'm glad you're here! Okay, well...you can come and get this cold weather any time you want! I'll gladly trade...I'm SICK of winter and it hasn't even started yet!! Katheryn - Why was I not aware of this spitting-thing? Is it possible that llama's spit and Alpacas don't? Or were they just polite enough to not spit around ME? Darn! I missed the prize for guessing alpaca. though I would have said llama anyway. I can relate to the apple part of the story -- when the squash come in, that is all we have day and night. it's amazing how many ways you can disguise a squash. thanks for the fun read! Dreamfarm Girl: You're very welcome! Thank you for commenting. I'll trade you some apples for some squash! Wendy Blum: HA! We did the whole apple-picking thing...and I over-estimated what we'd need...by just a smidge. I'm totally with you on the "NO SNOW" rule. I'd love it if the temp stayed at 70! Wouldn't that be just heaven?? saku chan: HA! The alpaca looks like Bella? And that's the name of my post...I can see how you'd be confused!! Preshant: ALPACA! A strange, yet friendly-looking animal, right?